Beach Lane Books, 9781442426405, 320pp. In the zany and humorous fourth book of National Book Award winner M.T. Anderson’s Pals in Peril series, Jasper Dash and his friends must escape the clutches of The Awful Autarch! 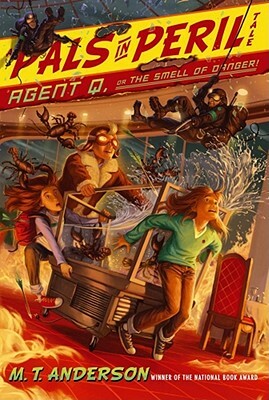 Having mopped up their last crime-fighting caper, our three heroes—Lily Gefelty, Katie Mulligan, and Jasper Dash, Boy Technonaut—are eager to get home. But the secret police in the war-torn realm of fantasy where the three kids are trapped (the state of Delaware) don’t want them going anywhere. Our dynamic trio knows way too much about the whereabouts of certain fabulous treasures to escape the grip of Delaware’s Ministry of Silence. So, chums, it’s a race to the border of New Jersey against spies and government agents and double-crossers...That is, if our heroes make it home alive! Chock full of ups, downs, twists, turns, a shark pit. and even a band of sentient lobsters fighting on the side of Good, this fourth installment of the Pals in Peril series is every bit as wild, wacky, and wonderfully outrageous as the first three. M.T. Anderson is the author of the Pals in Peril series; The Astonishing Life of Octavian Nothing, which won the National Book Award; The Game of Sunken Places; Burger Wuss; Thirsty; and Feed, which was a finalist for the National Book Award, a Boston Globe-Horn Book Honor Book, and the winner of the Los Angeles Times Book Award for Young Adults. He lives in Boston, Massachusetts. Visit him at MT-Anderson.com. "A humorous dystopia with funny black-and-white illustrations."